Kingsley Moghalu, pesidential candidate of the Young Progressives Party in Nigeria. 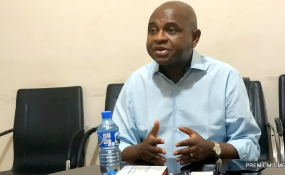 The presidential candidate of the Young Progressives Party (YPP), Kingsley Moghalu, visited PREMIUM TIMES head office in Abuja on Tuesday. Mr Moghalu, a former Central Bank deputy governor, explained his programmes and plans for the nation if elected president in 2019. He spoke to Editor-in-Chief Musikilu Mojeed, Assistant Managing Editor Ini Ekott, Business Editor Bassey Udo, and Correspondents Samuel Ogundipe and Lois Ugbede. PT: How has it been so far? MOGHALU: It's been a rewarding, fulfilling journey that has enabled me to experience the realities of our country at first hand at different places and in different ways, especially the weak infrastructure environment. As you know my campaign is not funded by stolen government money. So, we don't have the resources to rent private jets. I travel by road, by ordinary commercial air. I have been to about 30 states. When you go through that, traversing the whole country, you see why I am often late to events. This is because the transport system just doesn't work. Either the roads are terrible, and you never arrive at the time you estimated you should, or the cars break down, or the flights are delayed. Nevertheless, I am encouraged and hopeful for Nigeria, I remain more determined in the course I have chosen to make myself available to serve this country as its president. PT: When you talk about your campaign not being funded with stolen money, but some people would say you were in the Central Bank, and perhaps you made some money while there? MOGHALU: I did not. I lived on my remunerations as a public servant for the five years I was there. Outside of that, just my savings. I never involved myself in any corrupt practice. So, my campaign is funded with contributions from friends and just ordinary Nigerians and investment of my own savings in a sacrificial manner. I have not earned one kobo or any income in the last one year, because I have dedicated my life to this country. I have turned down numerous offers of consultancies for this cause. I gave up a teaching position at The Fletcher School of Law and Diplomacy at Tufts University of Massachusetts to return home to do this. Of course, consultancies offer a lot of money. But, I just cannot concentrate on those things anymore, except I am not serious about running for president. And I am serious, as serious as a heart attack. PT: So, why do you really want to be president of Nigeria? MOGHALU: Because this country can be much better than it is today. Because our children and our youth deserve something new, something different, something bold. Because the poverty in Nigeria simply cannot be allowed to go on. Because the recycled old politicians have failed, and if we allow them to continue to just perpetuate themselves in power, it means that we have elected to short-circuit our own destiny. They do not have the competence and vision to give this country what it deserves. You cannot give what you do not have. So, we have tried the PDP (Peoples Democratic Party); we have tried the APC (All Progressives Congress). We have found both of them to be the same. So, there is need for a paradigm shift. There is need for a generational shift away from the usual in this country today. That's why I am running for president. Nigeria needs a leader that can take the country into the 21st century, a leader with the technocratic competence that can solve practical problems, managing the economy, nation building, and foreign affairs. No candidate in the race today has the experience across these three areas combined the way I do after 17 years in the United Nations, helping fixed broken countries like Rwanda, Cambodia, and Croatia; after five years as deputy governor of the Central Bank, at the commanding heights of economic management, and having a good track record. It is not just holding a position that matters. It is what you did with the position. So, after being a professor in one of the prestigious universities in the US. So, all these things tell me that if one has the mandate to serve Nigeria as president, because I love my country, because I have been able to show that I have capacity, and I have the authority of the level of the presidency, we can transform Nigeria for our citizens. PT: No doubt, you have all the ideas to transform Nigeria. But, must you be president to achieve all that? MOGHALU: Of course, I must not. I am not desperate to be president. But, that does not stop me from offering myself to Nigerians that I will like to be president. I have found though the reason I am running also is that when you say you must not be in the political arena or not be president, you are leaving politicians who have shown that they don't have the capacity, or even the intention of turning this country around in a positive way. Maybe one wants to make oneself content with an appointment at a technocratic level. We will find out. But, that does not solve any problem. It is the political authority that matters at the end of the day. Who has it? Is that person competent or not? If that person is not competent, forget the story. You are going nowhere. That's why the change can only come at the level of elected political authority, the presidency. Given that my experience rises to that level in terms of relevance of experience, seniority and leadership, then, of course, it is natural for me to seek to be president. PT: How do you respond to those who say you are just not realistic with your presidential campaign? You have just mentioned how difficult it is to transport yourself around because the system is just not there, even when you have the finances to do so? MOGHALU: So, we should accept it? PT: You are campaigning against people who have private jets, and people are saying it is not just realistic. How would you respond to that notion that you are just running for the sake of it? MOGHALU: No! I am running to win, and we will win. That's number one. Number two, to accept the notion that you should not run for the presidency if you do not own private jets, or do not have billions and billions of Naira, is to accept the notion that all of us 200 million Nigerians are the children of lesser gods. I am not a child of a lesser god. So, why are our people like to accept or believe they are inferior to the political class, and the corrupt, recycled class should continue to Lord it over all of us in their incompetence and steal our future? And we encourage them to do so, and celebrate them, which is effectively what you are doing, by telling me it is unrealistic to run for the presidency, because I do not own a private jet. If you were telling that to yourself, are you telling yourself something that is positive? Or are you accepting yourself as a failure? Why should we place such little value on our lives as human beings and think that because politicians are corrupt and have money we should worship them? PT: Let's put it this way, here are people who have billions. They are in control of, perhaps, security architecture; they have private jets and all the money in the world to buy votes and to do whatever. Now, here you are fighting against them, with relatively very little resources. How are you going to do it? What is the magic? MOGHALU: Realities are created by human beings. We should never accept that realities are immutable and unchanging. You are describing a reality that has been existing previously. But, we have seen situations change in this country. There was a time it was "reality" that one military general will have five political parties adopt him as the presidential candidate. That was "the reality", right? Is that what happened? MOGHALU: Of course, it was not what happened. So, different things that were unforeseen happened. So, let us not trap ourselves in some "reality mentality" and surrender our possibilities to failure. That's all I am saying. That's why I am running for president. I am running with a plan and the strategy to overcome the odds against us. But, the people have to cooperate with us. And I know that Nigerians today are tired of this situation. Therefore, the ground is ripe and fertile for a disruption. So, your understanding of reality is different from mine. I have been to 30 states of this country; talking to ordinary people and you are sitting here in a boardroom telling me something I know differently, that Nigerians want something different, something new and something bold in 2019. PT: On Election Day, there are about 120,000 polling units across the country. And you need to put your people there, and this costs a lot of money. You have just told us you did not steal money while at CBN, and you are not likely to have all the money these people have to throw around. How are going to crush them? MOGHALU: We are making plans to put our people there. Don't worry. It does not matter. If money were everything, there are some candidates in this race who would have been president some 25 years ago. They have been at it since then. They have not. But, they have always had a lot of money. Let us be careful about the worship of money. Money is necessary to run an election in terms of logistics and messaging. But, I want you to know that in this country, what we have is a political industrial complex in which politics have become the biggest business in town. They will tell you you need N50 billion or 100 billion to win this election. N90 billion of that will go into private pockets of a lot of politicians. Do you see what I am saying? So, I am not intimidated by that exaggerated notion of money as the king of everything. You need some of it, I admit. We have people who will support us financially. Citizens, not anybody anywhere. I have no Godfathers. God is my only father as I always say. I am happy for it to be that way. But, we have plans and strategies that we are executing. Look at today in Nigeria coming from nowhere politically nine months ago when I announced, we (the Young Progressives Party, YPP), and my presidential candidacy, are effectively the third force in Nigerian politics today. We have changed the reality already. The narrative is changing. That is a reality shaping phenomenon. Is it not? So, today nobody is just saying APC, PDP. No! The possibility of an alternative outcome, is being very seriously discussed everywhere in Nigeria. PT: Are you not also concerned about the power of incumbency? You came into the race; went into a party that practically had no network before. So, what's your strategy for disrupting an incumbent? MOGHALU: Let me tell you something. This campaign is operating at three levels. There is a level of the 10,000 feet helicopter bombing that is going on - speak in the media, television interviews and all that. There is the ground game. We have a network across this country. The YPP has a network. Me, as a presidential candidate, I have a network across 774 local government areas of this country. You will be shocked when the result of this network demonstrates itself in February 2019. I will win the presidency like Donald Trump won it in America in 2016. When we went to bed thinking we had walked into the coronation of Hillary Clinton and woke up in the morning and Trump was the president. That is what is going to happen in Nigeria. PT: That means you will crush Buhari and win the elections? MOGHALU: We will defeat him (Buhari). That is the plan. PT: Even with all these social intervention projects, giving traders money and doing all of these? MOGHALU: That is vote buying. Let me give you a quotation from the Christian Holy book. "Some trust in their chariots, others trust in horses; But, we will call upon the name of our God." I want you to understand something that we are in a historical moment in Nigeria. People are tired of the recycled old politicians. Our people want something new. You are under-estimating the strength of that feeling. But because I have gone across the whole country talking to ordinary Nigerians, I know far more accurately how people feel. So, there is nothing impossible about defeating an incumbent. Mr. Buhari defeated an incumbent, right? And that person ceded power. PT: But, perhaps with far more resources? MOGHALU: Sure. That's fine. What we are going to have in January 2019 is going to be a peoples' democratic revolution. It is a revolution that will come from the people themselves. It is not going to be driven by my resources, because I do not have them. PT: When it comes to competence, of course most people don't doubt your competence. But, Nigeria is in a situation where people keep saying look our problem is not necessarily about politicians, but structural. There is already debate on the table about restructuring. What do you make of restructuring this country? MOGHALU: I am the only presidential candidate today that has laid out a very clear vision of constitutional restructuring. I will give you my lecture at the Nigerian Political Science Association Annual Conference in the South East zone which I gave sometime in October at the University of Nigeria, Nsukka. There I laid out a very clear vision of restructuring, going beyond people just using the term to seek votes. I am not using restructuring as just a phrase to catch votes. I believe that Nigeria cannot survive if we are not constitutionally restructured. By that I mean Nigeria must be re-federalized. We must be brought back to becoming a proper federation. To be very clear about what I mean, restructuring is not just devolution of powers, state police. That in itself is not restructuring. It is a part of restructuring, but in and on itself, is not restructuring. So, there is a 419 version of restructuring and there is the real restructuring of Nigeria. Any restructuring that is not accompanied by a fundamentally new constitution, that recreates a proper federation for Nigeria, as was done in 1963 constitution, will not address the problem. The problem, as we said, is structural. As president, I will lead this process of restructuring Nigeria, working closely with the National Assembly and the state assemblies. So, my vision of restructuring is one in which Nigeria is returned to being a federation, that's number 1. Number 2, in which that federation is structured on the basis of the central government and sub-national government that are the geopolitical zones, which will become economic zones, not on the basis of states I want to be very clear. I believe that the federating unit should be zones or regions. PT: That is six zones? MOGHALU: Yes! They could be six, or slightly more if the people decide they want that. I am not the people alone. But, I believe that the six geo-political zones at this point form a good enough basis. The truth about state creation is that you have about 400 ethnic nationalities in this country. If you want each and every one of them to have their enclave, you will have a riot. So, I don't believe all these ethic agitations for state creation is what will solve the problem of Nigeria. Nigeria's problem will be better solved by a structure that works and the development of a vision, and a national ambition that cuts across our ethnic identities. That's the kind of leadership I want to offer Nigeria, so that Nigeria does not become a place of contending primitive ethnic tendencies, but a place where vision reigns; a place where we can actually become a global power by developing our human capital; running an innovation economy and our possibilities as a dynamic and entrepreneurial people are fully unleashed. I don't want to be the leader of a Nigeria in which tribe and tongue and religion is the sole deciding factor for a lot of things. We have that type of Nigeria today, because the so-called leaders we have are not able to rise above the things that divide us. I operate above the levels of the divisions and so I can, as a president, motivate, mobilize, inspire and envision Nigeria to a very different place. So, No. 1, restoration of proper federalism. No. 2, a structure based on regions, not states, for many reasons, but mainly economic. The regional structure is far better for the development of Nigeria's economy than the States structure. Many states are not economically viable today and will not be for a very long time. PT: Just to be clear, are you going to have the regional structures covering for the state, or the states will not exist at all? MOGHALU: That is a matter to be discussed in the process of restructuring. PT: But, what do you recommend? MOGHALU: The States structures could become administrative provinces under the regions. But, there is a regional structure that is superior. That means, implicitly, No. 3, a local governments cannot be a constitutional tier of government. They can be created by regional structures and managed. There is no Federal Republic I know, except India, where local governments are a constitutional tier of government. That way it's simpler because the federation is where power is shared and neither the federal government nor the federating units are superior to the other. That's a proper balance. It is a good model of government for countries that are large and diverse. Most times it works better. No.4, I also believe religion should be separated from public life, public policy in Nigeria. PT: Separation of church and state? MOGHALU: Yes, separation of religion and state, because religion includes church, mosque and whatever there is. So, that is my vision of restructuring. It is a very clear vision. Everybody talks about restructuring, but many of them cannot tell you what I am telling you. PT: You talked about yourself not liking all these primordial religious and ethnic tendencies. Is that why you are running now when you should be waiting for, maybe 2023, when the Igbos, to which you belong, may have a better chance? MOGHALU: (Laugh!) You make me laugh and you are making me laugh in Hausa, Yoruba, and Ibo. Here, it is called a Wazobia laughter. Please, speaking seriously, I believe Nigeria should have a merit-based presidency so that we can actually make progress. We should stop rotating inside poverty. We are rotating inside poverty. Do you like that? MOGHALU: Then, why should I like it? We are talking about progress. But in this country instead of looking at the issues that are really making our life worse every day, we are busy celebrating mediocrity, we are busy recycling mediocrity in the name of zoning. Of course, I don't believe in those types of ideas, you know. Like I said I want to take Nigeria to the 21st century, and most Nigerians in this country are not interested in those antiquated notions about zoning and all that. I can tell you that. Nobody is interested who wants progress. PT: But have you not been told by people who are Igbos like you that why are you running now when you could have been patient to wait for the turn of the Igbos? MOGHALU: There is no turn of anybody. Anybody who believes that somebody else should give you your turn to something that is your constitutional entitlement, that person simply has an inferiority complex. I don't have an inferiority complex, politically speaking. I don't have a second fiddle mentality. Let me, on a final note, that say the people of Nigeria will elect their president in 2019. So, let's just take this matter to the people.